Kedang Ipil village sits beside a small tributary of the Mahakam River, in the district of Long Bangun, about six hours’ by road from where we are living in Balikpapan. The name means ‘River where merbau trees grow’ (Intsia bijuga). Until 20 years ago when the road arrived, that river was the only way to reach the village. But nowadays the river is no longer navigable, due to damage caused by the nearby palm oil plantations and coal mining. 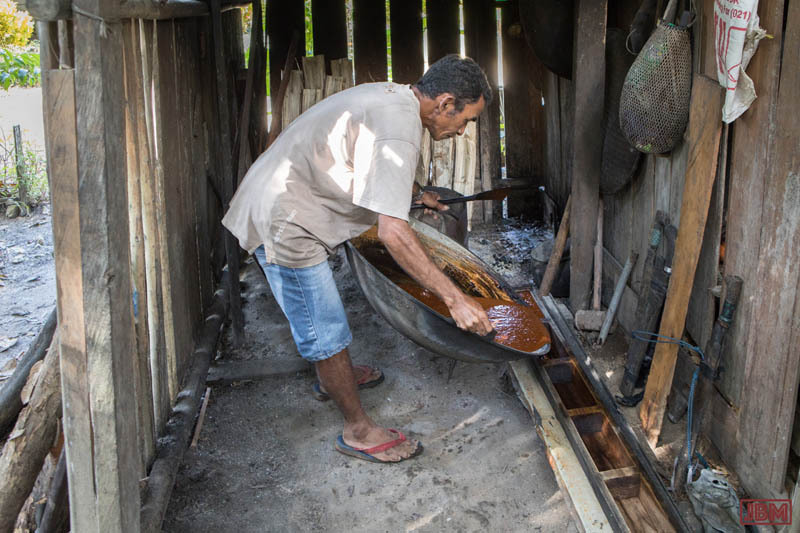 We previously visited Kedang Ipil last October, when (amongst many other experiences) we learnt how to make gula aren palm sugar. It’s a really interesting and friendly Kutai village. 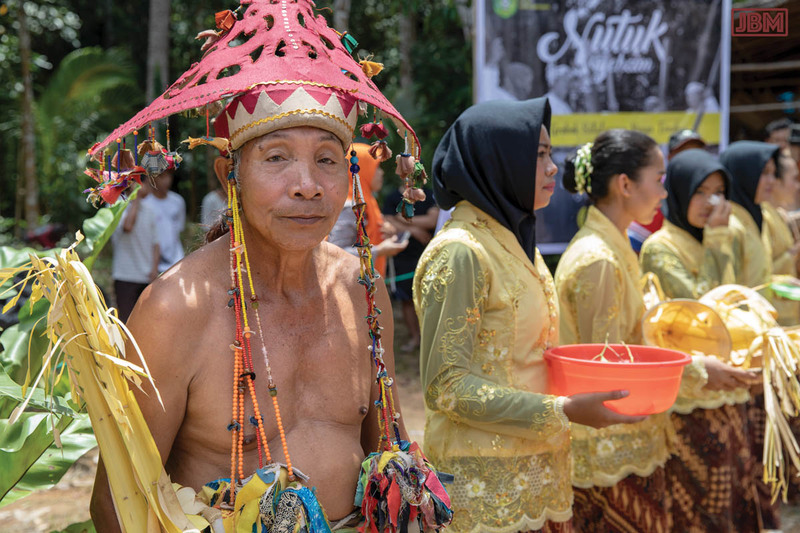 Muslim, Protestant and Catholic, united by their Kutai cultural identity, and their shared observance of traditional celebrations and rituals. When we heard that the Nutuk Beham harvest festival was to be held there from (13-15 April), we scrambled to attend. 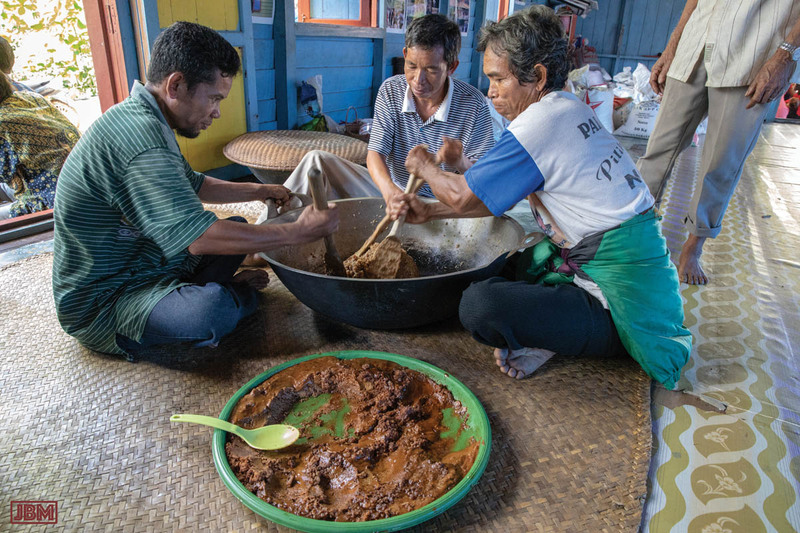 Nutuk Beham is the local (Kutai) name for a dessert dish made from glutinous rice (‘sticky rice’, or ketan or pulut in Indonesia), flavoured with coconut and palm sugar. 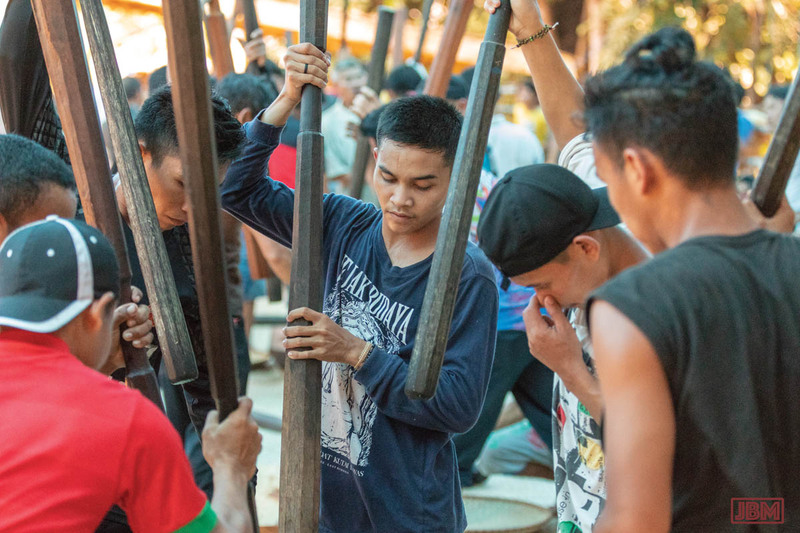 The central activity of the Kedang Ipil harvest festival is the production of nutuk beham – in truly industrial quantities. 72 hours of non-stop cooperative effort. Gotong royong! Only beras ketan (glutinous rice or ‘sticky rice’ – Oryza sativa var. glutinosa) can used to make nutuk beham. 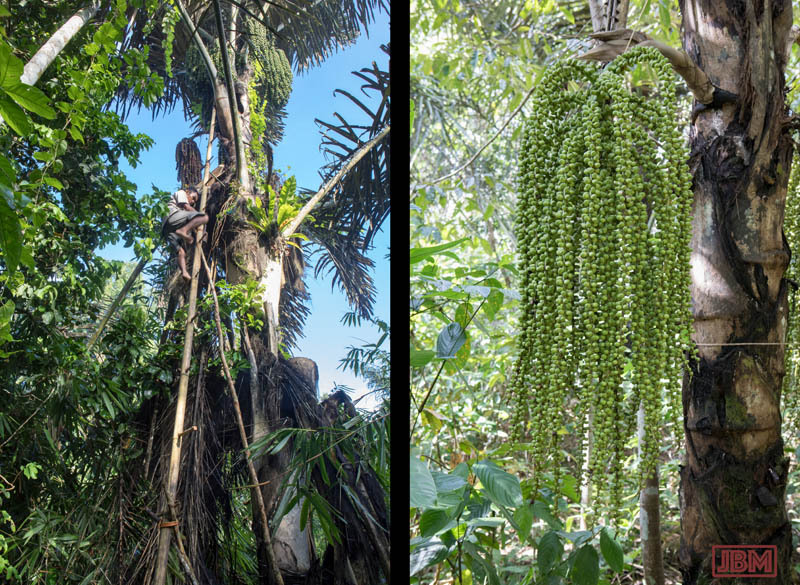 And it must be grown in ladang gunung (slash and burn fields in the forested hillsides). Irrigated padi rice is not to be used. 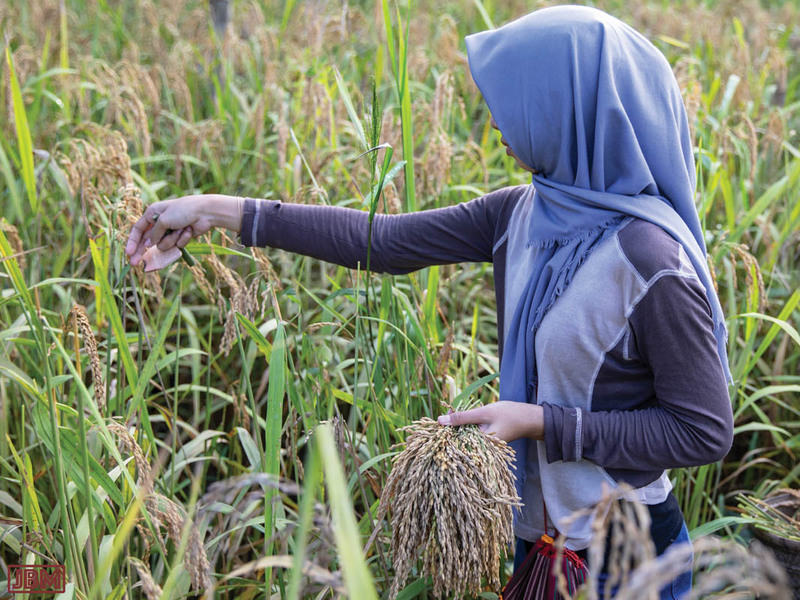 Each ladang farmer is expected to provide one 40kg bag of beras ketam for the harvest festival. 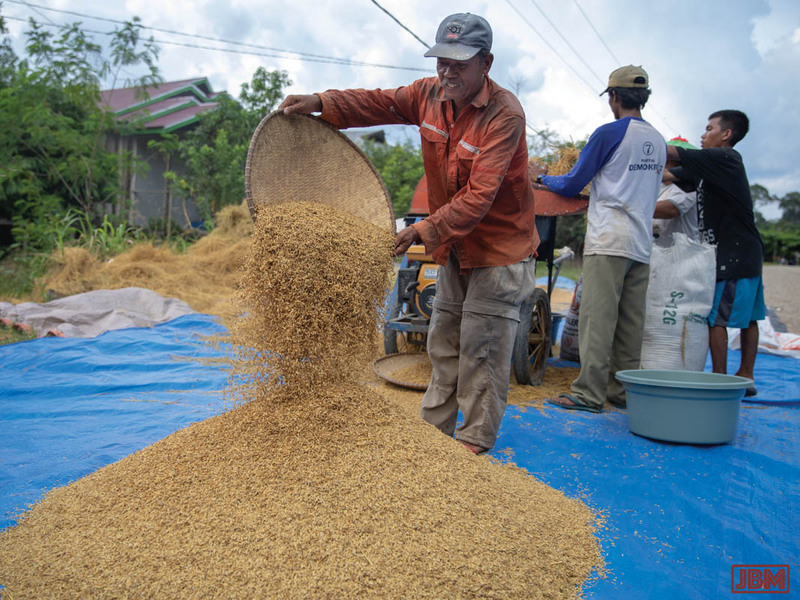 The harvested rice is threshed to separate the rice seeds from the stalks and other unwanted material. 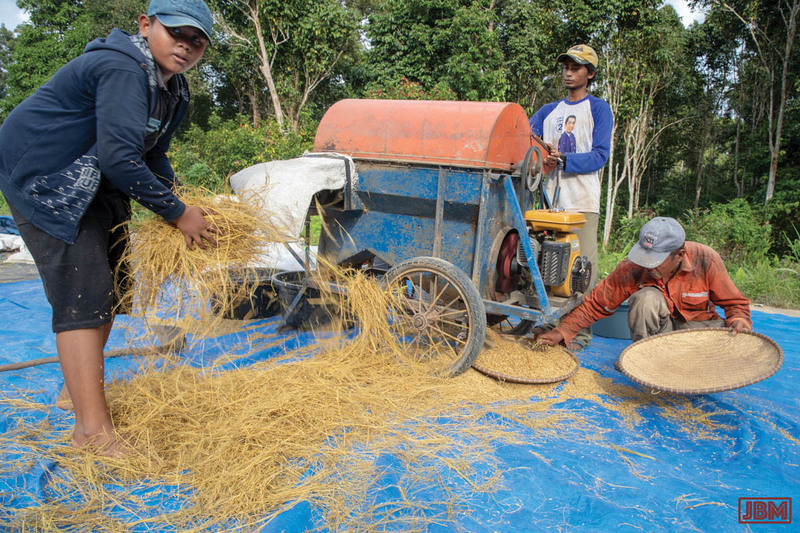 Until fairly recently this was all done manually, but these days a threshing machine (mesin perontok) like this is usually employed. 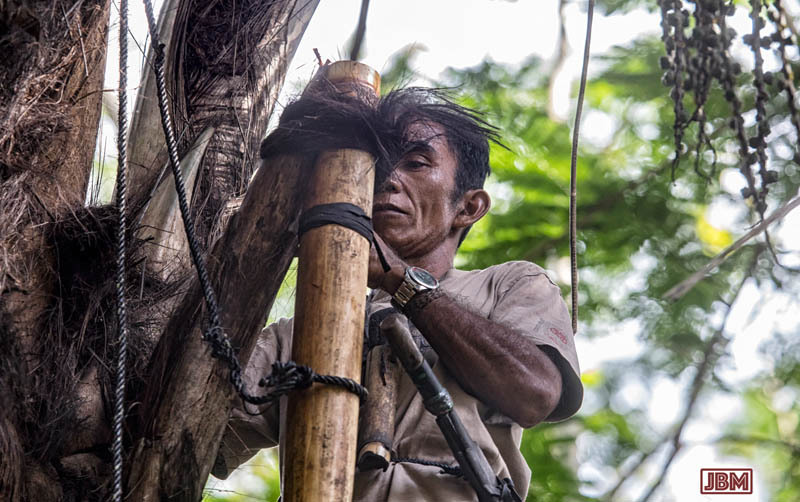 This one, set up on the road at Sedulang village, on the way to Kedang Ipil, has been in use for more than ten years, and is shared amongst farmers of the village. The tarpaulin that they have set up on covers the road, so it’s just as well that this road (which is the main access road to Kedang Ipil) doesn’t get a lot of traffic. 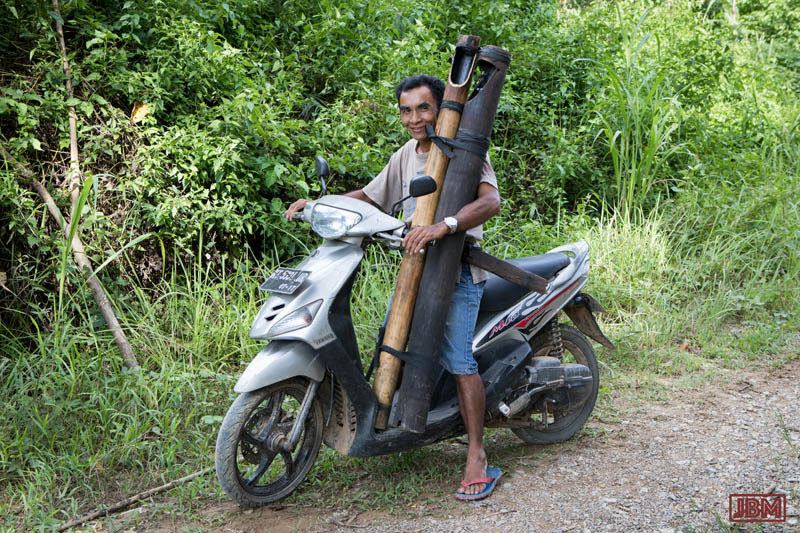 When a car or truck does come along, Pak Ari and Pak Muttakin have to move the tarp. The thresher does a remarkably good job of separating out the grain. The grain is sun-dried for up to three days (depending on the weather), and then bagged. The stalks and chaff are discarded, because not even the goats will eat it. 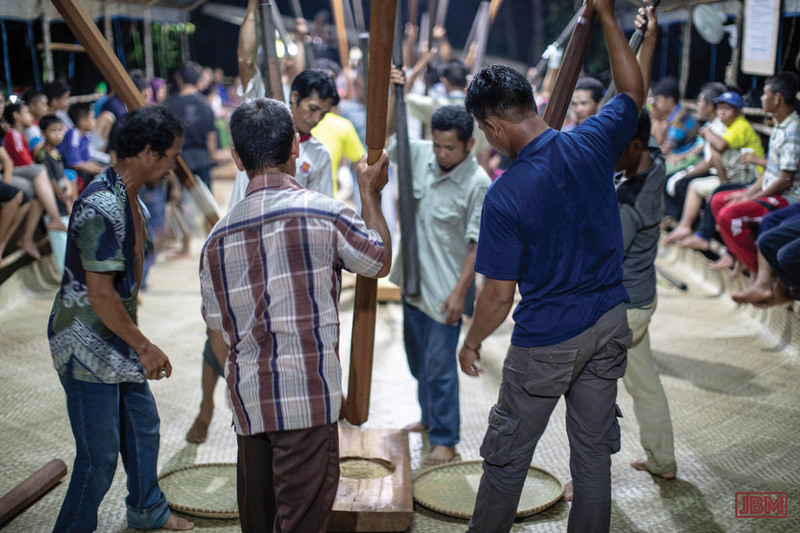 The weighty bags of beras ketan which are to be used to make nutuk beham are delivered to the central location where the festival is to be held. 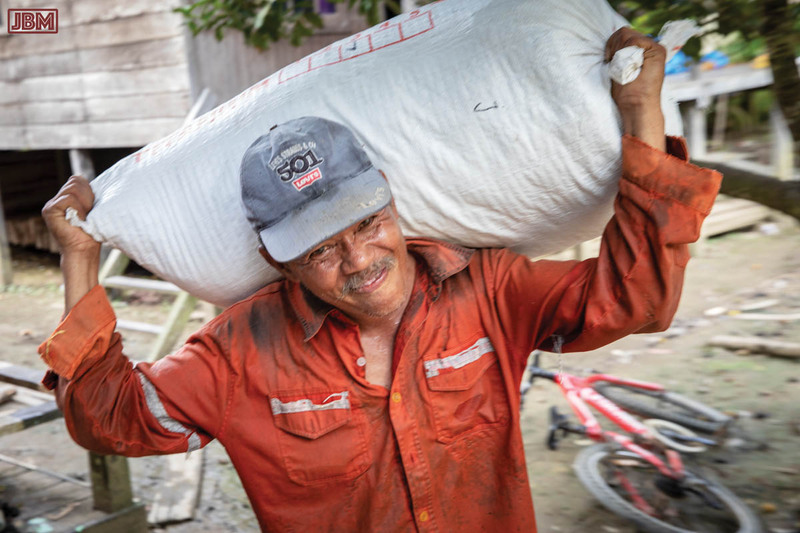 Here’s Pak Ari simultaneously grinning and grimacing under the load. 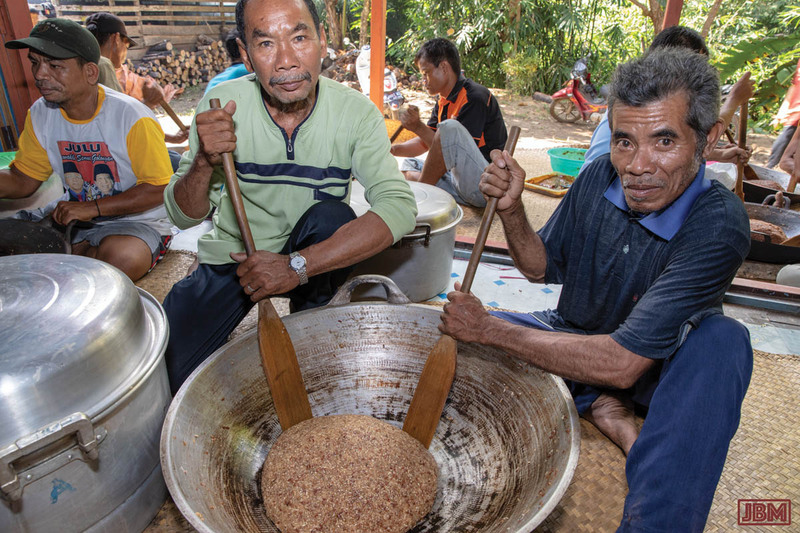 The full bags of rice are immersed in the river for three days to soften the grains. 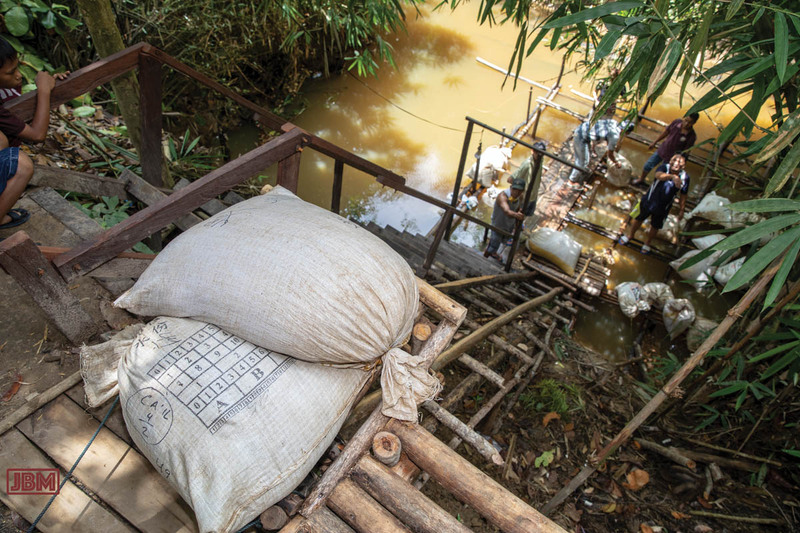 A specially built platform was constructed in the river so that the bags could safely suspended and thoroughly immersed. 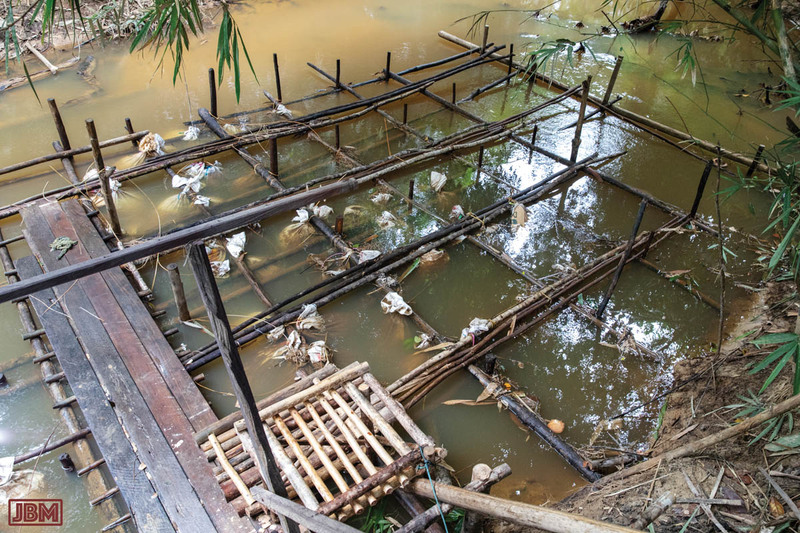 It looks a bit like an oyster farm. There’s a steep ladder/staircase going down the river bank to the platform, but this year (as a smart innovation!) they’ve incorporated a little hand-pulled elevator to transport the heavy bags of rice down to the platform and then back up again after soaking. 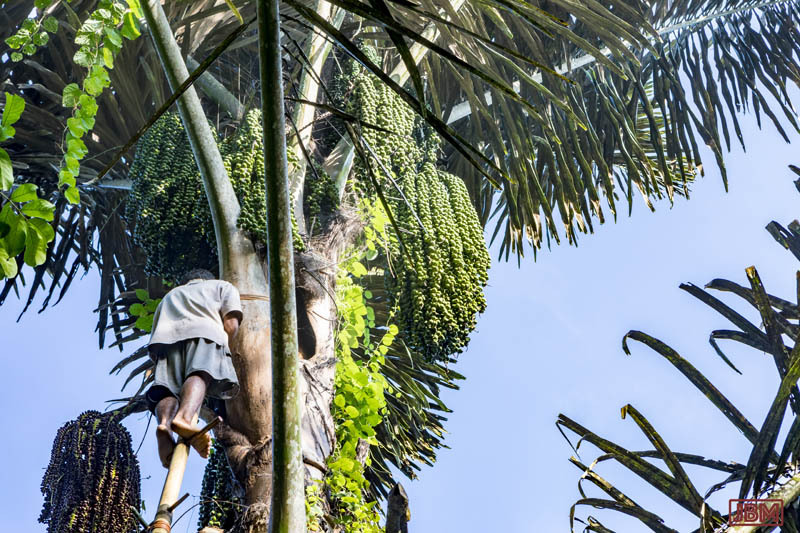 It requires five or six men to pull on the rope to bring the full bags of soggy rice back up to the top – but it’s still much easier than lugging them up the steep stairs. 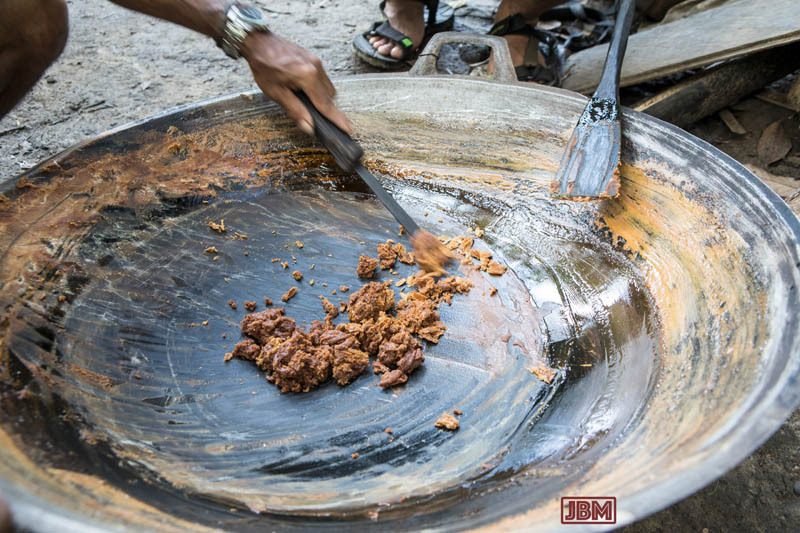 Retrieved from the river, the rice is then cooked dry in one of a number of large woks (kwali or wajan). Firepits were dug in three parallel rows to house the cooking fires, and women tended the woks placed on top. I counted up to 25 woks in use at any one time, and the cooking continued, day and night, for the entire three days that we were there. Young men put 2kg of rice fresh from the river, into each wok, along with a half litre of water. The rice is quite dark coloured when it is soggy. 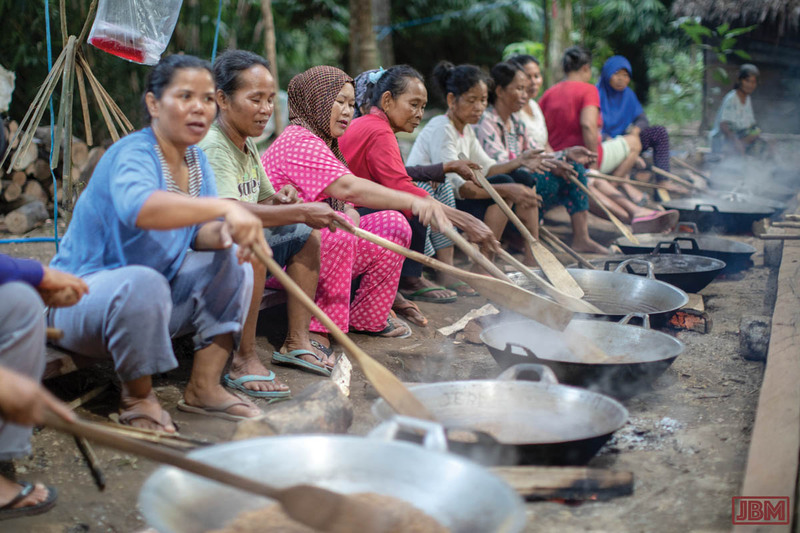 Then the women stir the rice with a long wooden paddle (dedeh), almost continuously so that it does not burn. The process is complete when the rice has turned a light golden colour and become a bit toasty. This takes between 30 minutes and one hour – depending on the heat of the fire below. The toasted rice is then spread out on a platform to cool down, before being bagged again. The next step is to pound and roughly ground the soaked and toasted beras ketan. A purpose-made building was used for this. It was about 40 metres long, about 8 metres wide, raised on wooden foundations about 2.5 metres above the ground, and fully covered by a wood-and-tarpaulin roof (though open at the sides). Seating lined the edge of the floor, which was covered with very large woven fibre mats. Evenly spaced along the length of the floor were five large ‘mortars’ (lesung) – each one a metre-long slab of hardwood with a bowl carved out of it. 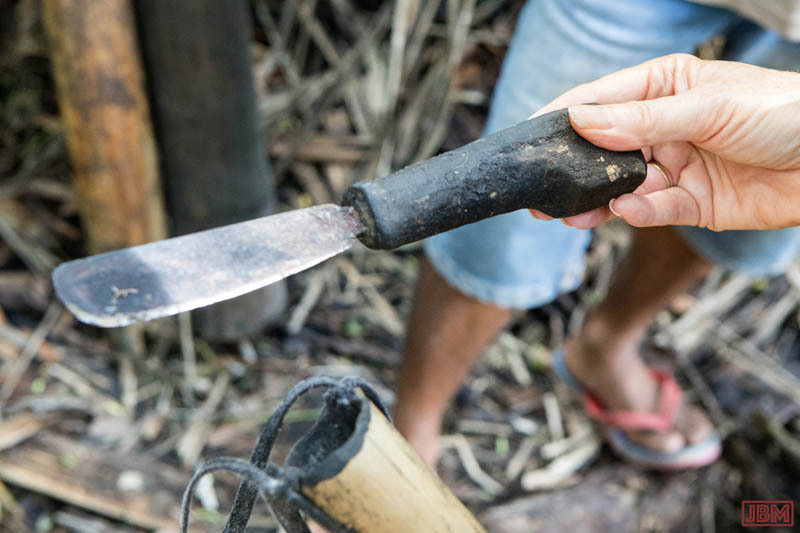 The ‘pestles’ (halu) were also made of hardwood (the best ones were made from kayu ulin (Eusideroxylon zwageri) or bangkirai (Shorea laevis)). 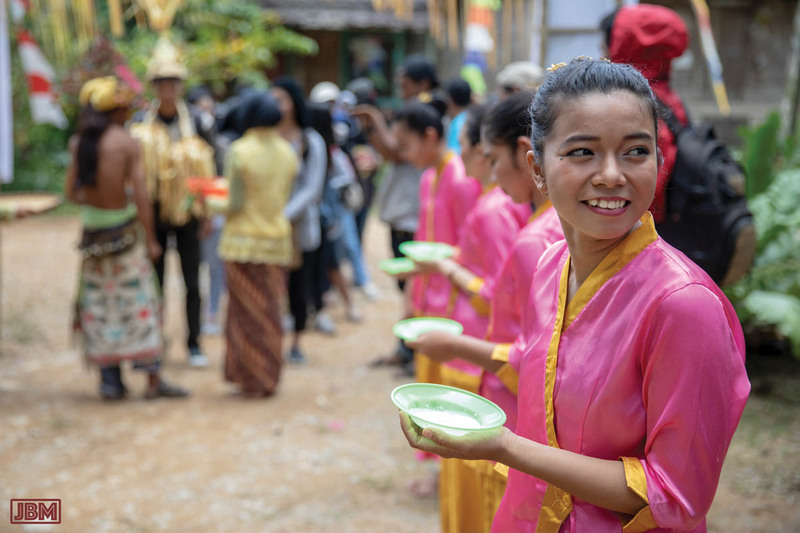 As 1.5kg of freshly roasted rice was placed into the mortar, a group would assemble and take turns to rhythmically pound the rice in the bowl. Both men and women participated, but men predominated. After several minutes of energetic thumping, the rice was removed and replaced with a fresh batch. 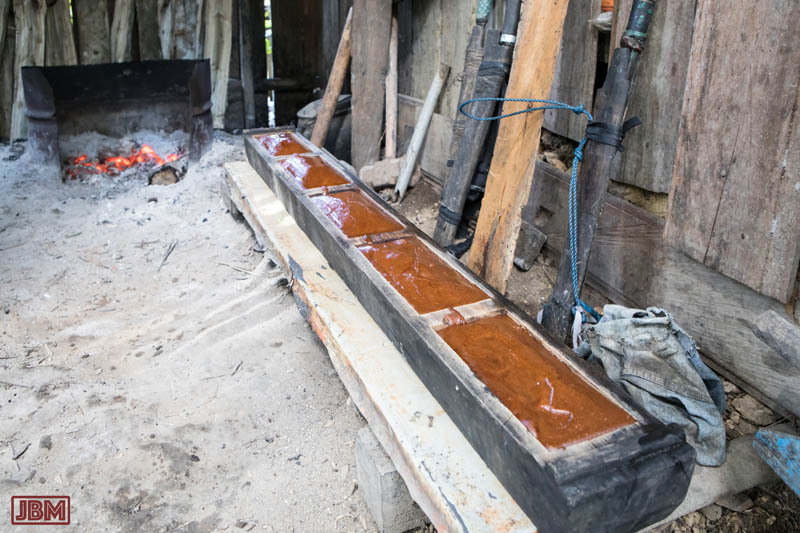 This process continued, without interruption, for the entire three days that we were there, with fresh pestle-wielders regularly replacing the ones who tired out. As we discovered, it’s hard and very hot work. Beneath the floor, immediately under each of the mortars, a log was suspended, hanging vertically. Each pounding of the mortar above would strike a blow on the end of the log below, making a lound ‘klokk‘ sound. 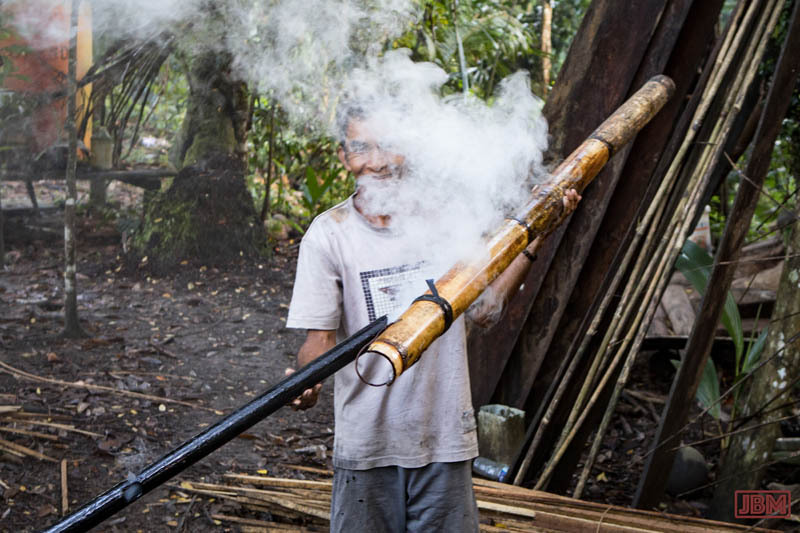 With the rapid pounding on the five separate mortars each producing a different tone, the combined effect was quite musical at times, resembling the sound of an acoustic, oddly syncopated gamelan orchestra. It was curiously hypnotic, and we could still hear them klokk-ing away throughout the nights, even from the house we slept in, several hundred metres away. 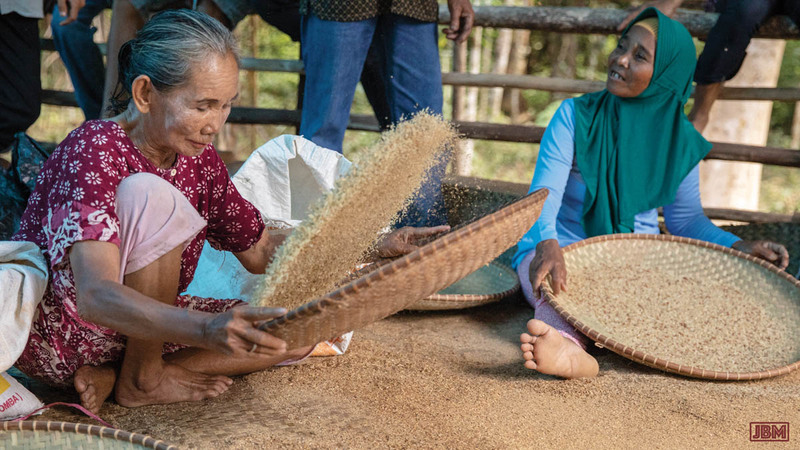 The pounding process produced more chaff, husks and dust from the rice, which was then winnowed to leave only the quality grain. 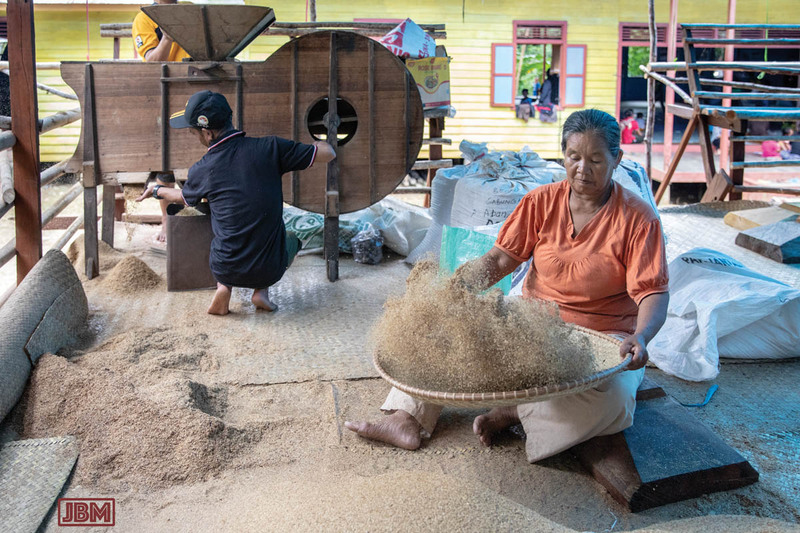 Much of the winnowing was done in the time-honoured method by hand (as demonstrated by Ibu Utau), but a much quicker method involves the used of a (still hand-powered) turbine, known as a tampah lewang. The winnowing doesn’t remove all of the heavier waste material – immature seeds, blackened seeds, and even a few little stones. 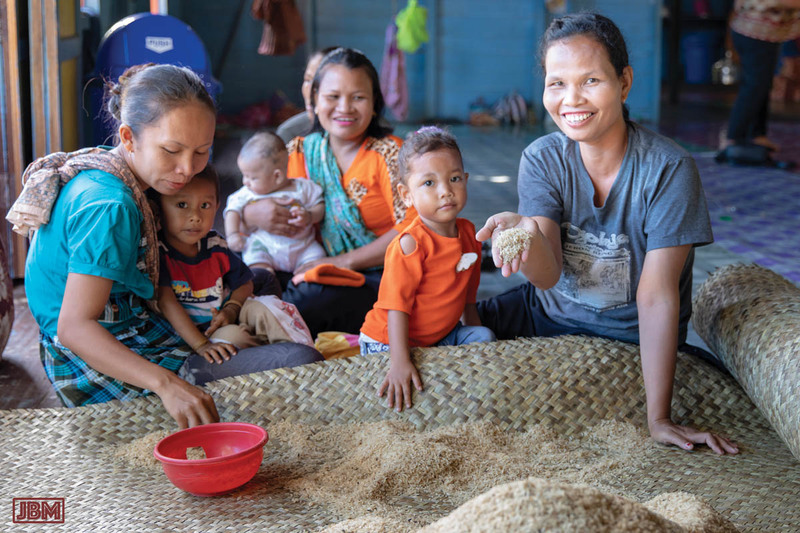 So the rice is spread out on large mats, and laboriously picked over by teams of women who removed any remaining, unwanted bits. 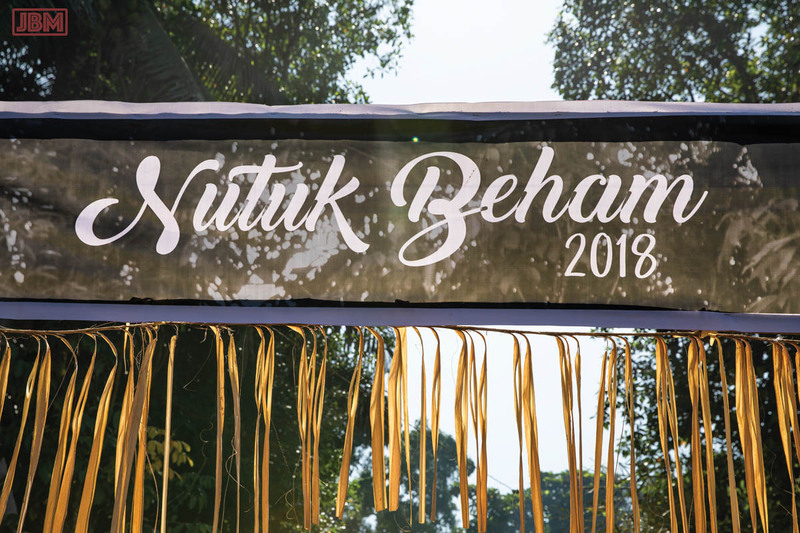 On the morning of the final day of the Festival, the nutuk beham was finally prepared. Interestingly, only men of the village were involved in these last stages. 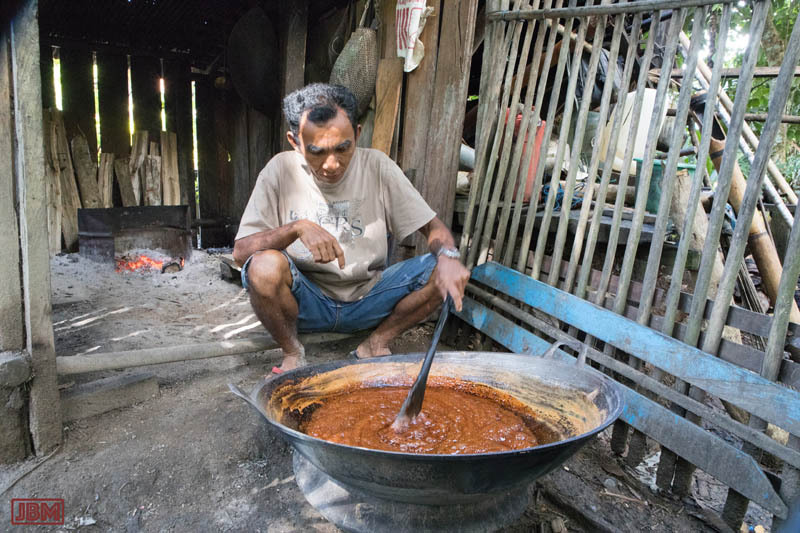 A couple of kilograms of the prepared beras ketan is placed in a wok, and few hundred millilitres of boiling water is poured in. 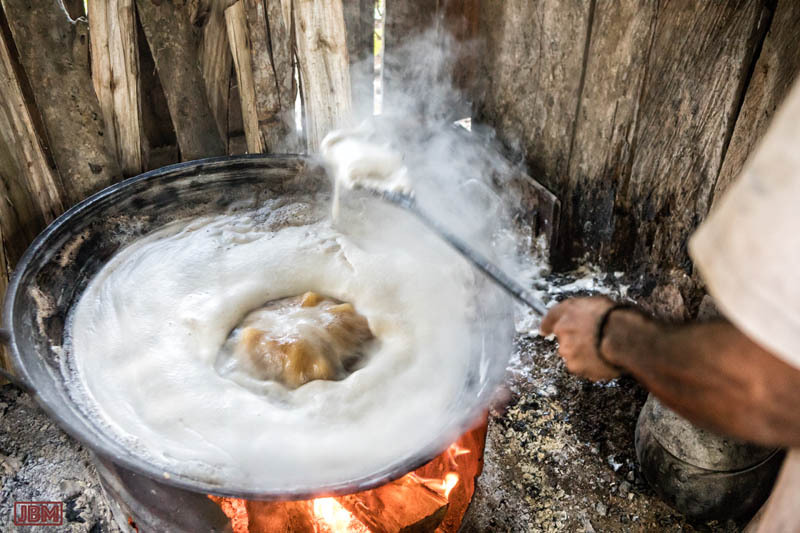 Two or three men then start to work the mixture with stout wooden ladles. 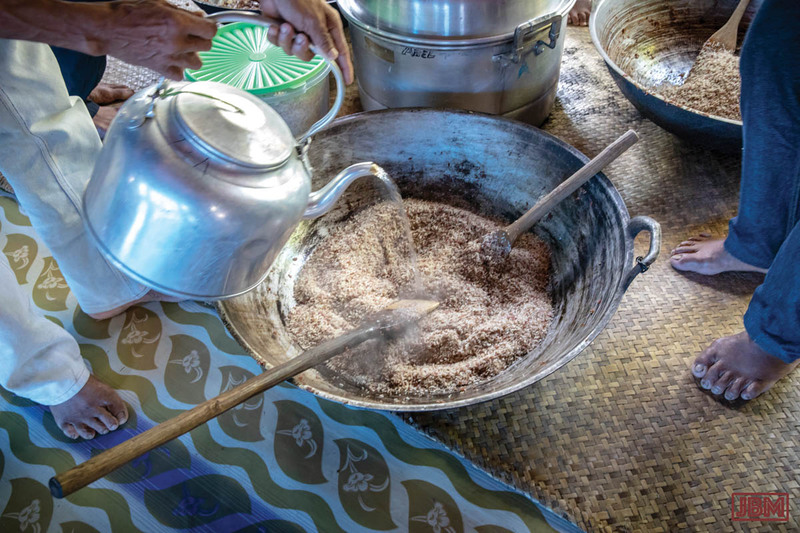 They add generous amounts of grated coconut, and then gula aren palm sugar. The mixture is stirred and shaped until it forms a smooth sticky ball. And then it’s (almost) ready to eat. The last step is the reciting of prayers in thanks for the year’s harvest. 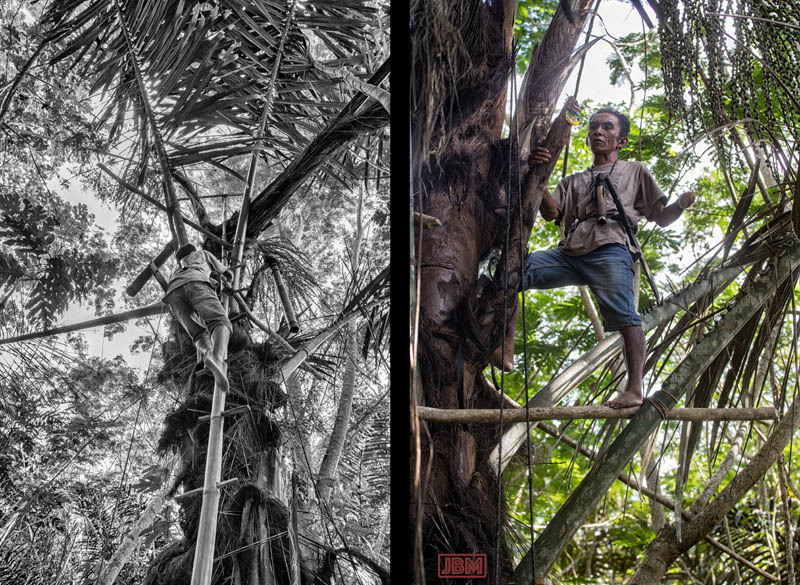 Four elders of the village (both Christian and Muslim) said the prayers, in the Mamang language which predates the Kutai language now commonly spoken here. 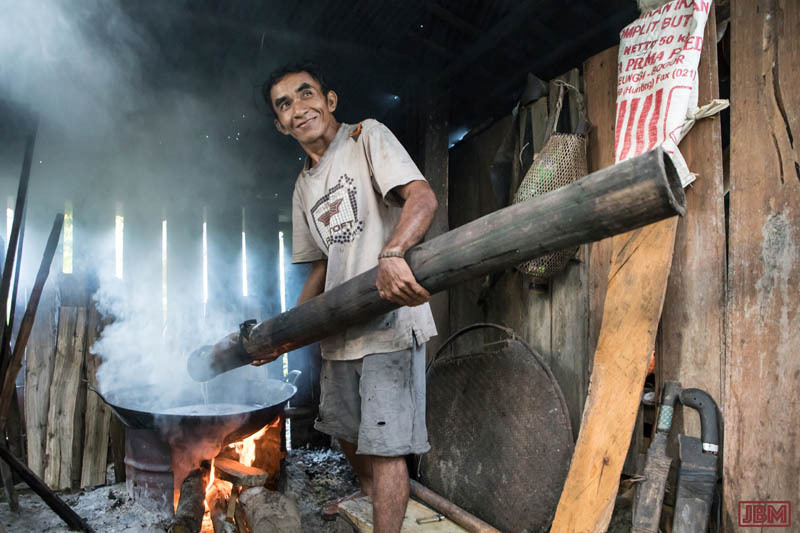 Only a few residents of Kedang Ipil are still able to speak the Mamang language – among them Pak Tajudin Noor, Pak Ganak and Pak Jondon. 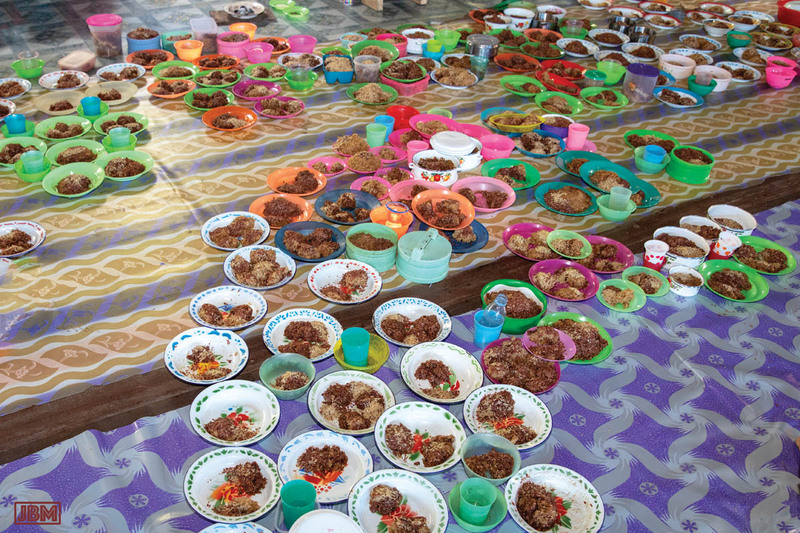 Generous servings of nutuk beham were served up on plates to feed the hundreds of people in attendance – who had been waiting and working for three full days for this moment. 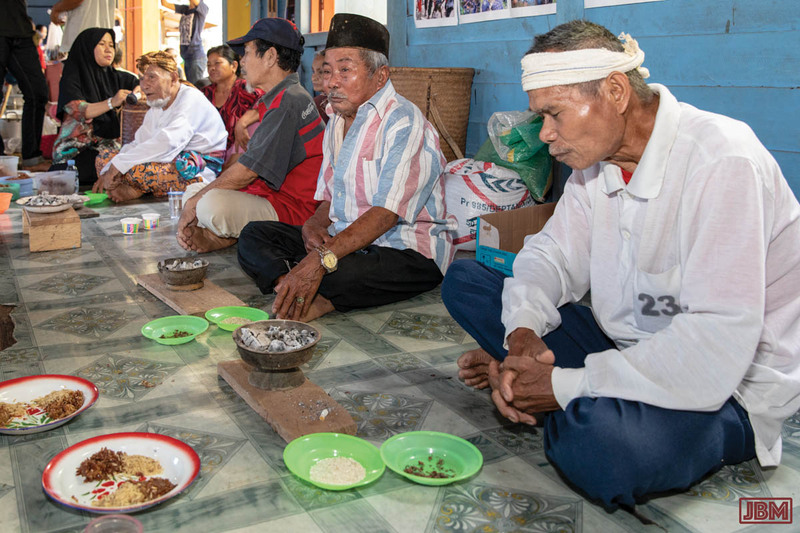 Everyone dined, in shifts, with the most prominent guests (including the Bupati of Kutai Kartanegara Bapak Edi Damansyah) served first. 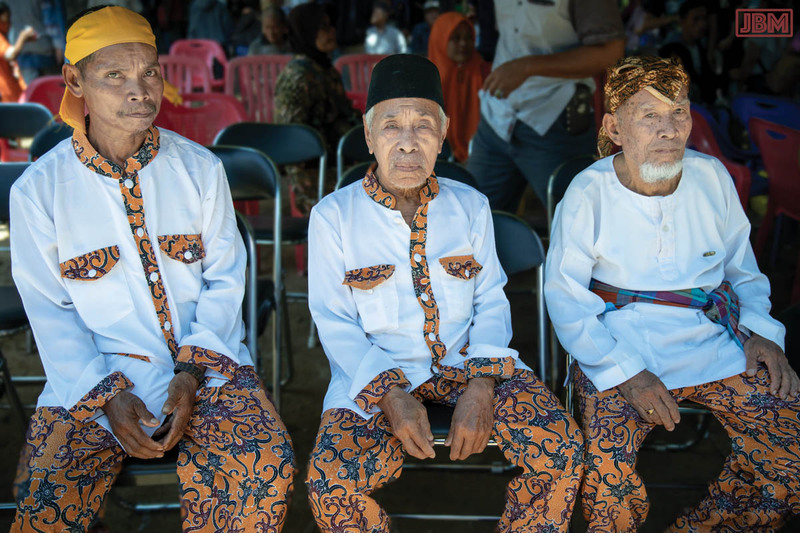 Elders of Kedang Ipil village, resplendent in batik cloth featuring Kalimantan motifs.